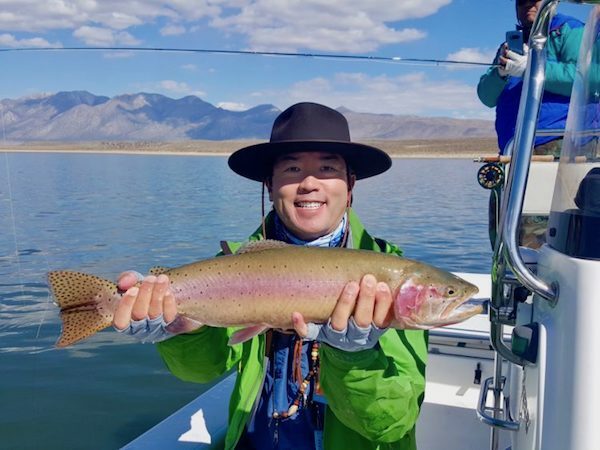 Todd Yamada fished with Two Bug and scored this sweet cutty! A much welcomed warming trend has set in for the week and into the weekend. Seasonal and pleasant weather looks to continue through the end of October. If you’ve wanted to view the splendor of the fall colors on the trees, they are now in full autumn color. The next possibility for snowfall may present itself by the first week of November. East Walker River in excellent shape now and some of the bigger fish are now coming to the net. 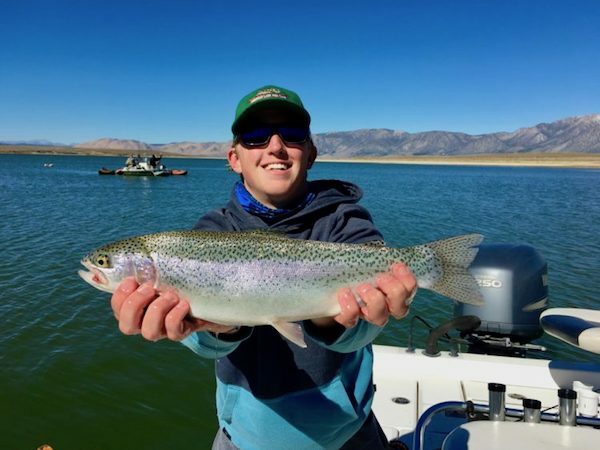 Upper Owens River has scattered school sized fish throughout, and a few larger rainbows have made their way upstream from Crowley Lake. Hot Creek good in the mornings after the frost comes off using small midge and egg patterns. 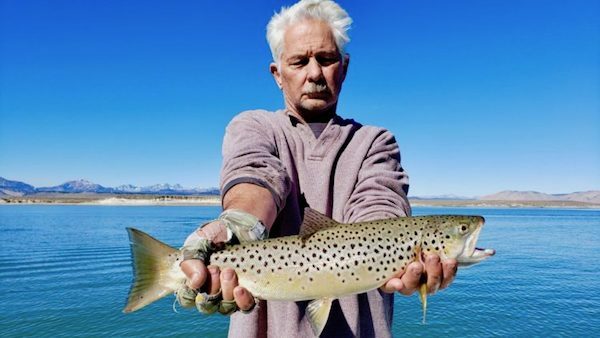 Middle Owens River on the drop and conditions are now prime for drifting. Flows have finally dropped to decent levels as of this report. Current cfs is 386. We will be running drift boat trips here shortly now and are predicting some good fishing as we make our way through the fall months. We have 17′ Willie drift boats ready to go and get you to some of the best holes and runs on the river which are inaccessible by foot. 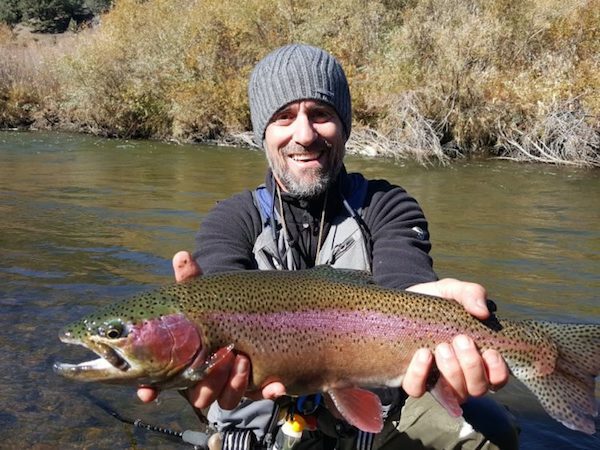 In the afternoons we are often times treated to some great dry fly fishing when the conditions are right, and the rest of the time we fish with sinking tip lines and streamer patterns to get the resident trout here to bite. We can fish up to 3 anglers per boat and offer half day trips (4.5 – 5 hours) or full day trips (7 hours) to meet your needs. We are awaiting the migratory rainbows to enter the river in good numbers. As the weather continues to get cooler this will trigger the fall spawners to start getting ready for their move. The section from the Benton Crossing Bridge down to the fishing monument is now closed. Flows have decreased to 87 cfs. The cooler water has prompted the fish to feed in the deeper runs now and target nymphs and egg imitations. Look for rising fish in the late-morning and afternoons as the daytime temperatures climb. They will be found in the slower eddys around the bends in the river. Flows now at 93 cfs. Excellent fishing now with the water temperatures reaching seasonal temps. Flows are down to very wadable and crossable levels. Seek out the deep runs and pools. Perch fry patterns stripped slowly back are a good call now. #18 Copper Tiger Midges, #14-16 Parallel Perch, #14-16 Level Leeches, and Assassins dark and light both Parallel and normal have been great patterns to hang. #18 flashback hare’s ears, #18wd 40’s, and SJ worms also working well. Mark Frasco is used to setting the hook on bass, but that didn’t stop him from showing this brown what he’s got! 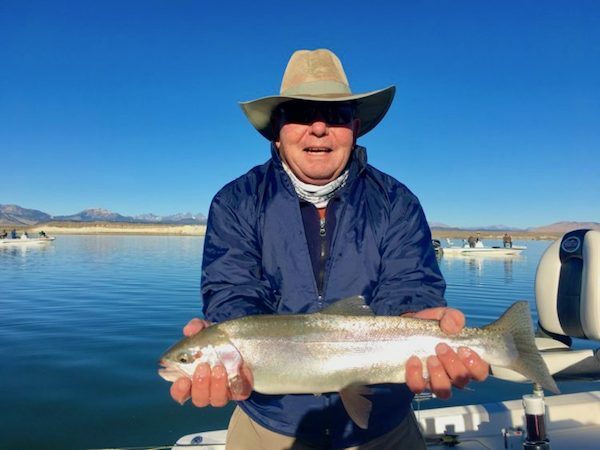 Ken Anderson fished with Jerry and displays this nice ‘bow! 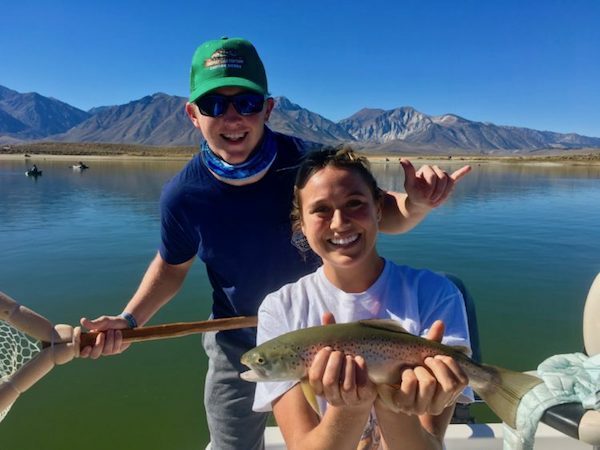 Brendan Steele and Grace Reingruber holding a nice brown while fishing with Jerry! Jerry got Brendan Steele out for some nice fish recently!